กุหลาบ สายประดิษฐ์ Kulap Saipradit (1905-1974 -- See Thai/English Wikipedia), better known as ศรีบูรพา Siburapha, wrote more fifteen novels, many short stories, numerous non-fiction books, and even translated a few novels into Thai. A pioneering modern writer and prominent journalist, he was at times jailed and eventually spent the last 16 years of his life in exile in China. Thailand's military dictatorships were not kind to the new guard of intellectuals and writers, and "Siburapha" is a prime example. A prolific writer, history has vindicated him, and he is now rightly celebrated as one of the great writers of the mid-20th century. The pen name Siburapha is two words, Si ศรี "glory" and Burapha บูรพา "east", which together "glory of the east" or "glorious east", which is not a self-aggrandizing reference, but rather praise for the land of his birth--the orient, or east. หม่อมหลวงบุปผา นิมมานเหมินท์ M.L. Buppha Nimmanhemin (1905-1963 -- See Thai Wikipedia) authored more than a dozen novels under the pen name ดอกไม้สด, which means "fresh flowers". ก้าน พึ่งบุญ ณ อยุธยา Kan Phuengbun Na Ayutthaya (1905-1942, see Thai Wikipedia) is well known as ไม้ เมืองเดิม Mai Mueangdoem. The first name ไม้ /máay/ "wood", is a reference to his true first name, ก้าน /kâan/, which means "twig" or "stem". The last name means "old (former) city", which is a reference to his last name, ณ อยุธยา Na Ayutthaya. The former Thai capital of Ayutthaya, often called in Thai กรุงเก่า /kruŋ kàw/ (which also means "old city"). Thai surnames that begin with "Na" and are followed with a city name indicate that that family is descended from former royalty of that city. Besides Na Ayutthaya, you'll also see Na Songkhla, Na Lampang, etc. มกุฏ อรฤด Makut Orarit (b. 1950) wrote the award-winning 1978 novel ผีเสื้อและดอกไม้ "Butterfly and Flowers", made into a film in 1985, under the name นิพพาน, the Thai word for "nirvana". จิตร ภูมิศักดิ์ Chit Phumisak (1930-1966, see Thai/English Wikipedia) was another of Thailand's great thinkers. He was staunchly anti-nationalist, and as such he was persecuted by the harsh military dictatorships that ruled for decades in the wake of the 1932 fall of the absolute monarchy. He was shot to death at the age of 36. He used more than a dozen pen names in his life, but given my recent post about wordplay, the one I find most interesting is จักร ภูมิสิทธิ์ Chak Phumisit, a spoonerism (คำผวน) of his real name. *Also known as นามแฝง "hidden name". Thais love wordplay. From คำผวน (Thai spoonerisms) to อะไรเอ่ย jokes (of the "what's black and white and re(a)d all over" variety), wordplay abounds in Thai. And of all the forms of verbal trickery in Thai, the pun is as alive and well as any other. Of course, I'm certain much punning whizzes over my head without my realizing it, but I catch enough to know it's common. One place I've been noticing puns lately is in movie titles. Take the recent four-segment horror film, สี่แพร่ง (literally, "four paths", i.e. a four-way crossroads). Its English title is 4bia, a pun on the word "phobia". This is a pretty lame pun in English, but it works better in Thai. That's because the way Thais are taught English, the word "four" is written โฟร์, and pronounced just like the first syllable of "phobia". The word for phobia in Thai is, well, phobia, and "four" is such basic English that every Thai knows it. So it still counts as a pun by Thais for Thais. And it's a better pun in Thai than in English, at any rate. รักสามเส้า น. ความรักที่ชาย ๒ คนรักหญิงคนเดียวกัน หรือหญิง ๒ คนรักชายคนเดียวกัน. love triangle n. love in which two men love the same woman, or two women love the same man. Putting aside the fact that their definition denies the existence of love triangles in which one or more members are (gasp!) homosexual, a classic love triangle involves all three having a relationship of some kind with the other two, rather than simple two-guys-after-the-same-woman competition. One would expect the two men to be brothers or mortal enemies or bridge partners. Something like that. Literally translated, the Thai phrase means "three-legged love". The pun in the film title is in the last word: เส้า "leg, support" is a homophone of เศร้า "sad, sorrowful". The implication is that it's a doomed love triangle. (Are they ever not?) Also note that the word เส้า is not the same word as เสา "column, pole, pillar", although the two words differ only in tone (and I wouldn't be surprised if they were etymologically related). On an interesting side note, my wife thought that รักสามเศร้า (with the word meaning "sad") was the correct spelling of this phrase, and says she has thought so for as long as she's known the phrase. The word เส้า is rare in Thai, so she had reanalyzed it in a way that made sense to her, by substituting it with a homophone which she knew. This is a good example of folk etymology. I don't know if this misconception is at all widespread, but it's a fascinating possibility to think that this movie title might be a covert pun for some folks, and that it may even reinforce the misconception. See also: this post from last year about a clever movie title, which involves both verbal and orthographic trickery. The next time you're feeling somewhat more than peckish, there's an easy way to get a heaping helping. Order your meal พิเศษ. In addition to its usual meaning of "special", พิเศษ is the secret code for a bigger portion. You can order พิเศษ at most Thai restaurants (in Thailand, at least--anyone know if this works abroad?). Of course, it only applies to things that can be portioned. You wouldn't ask for a "special" piece of chicken--you'd just buy two pieces. But this applies to all the อาหารตามสั่่ง "made-to-order" restaurants and food stalls that are so common, among other types of vendors. Typically, พิเศษ will run you an extra 5-10 baht, depending on the regular price. Shouldn't break the bank, anyhow. The opposite of พิเศษ is ธรรมดา "regular". 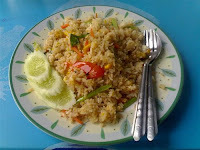 So if you wanted two plates of fried rice, one regular and one special, you could order ข้าวผัดสองจาน ธรรมดาหนึ่ง พิเศษหนึ่ง. Now go unleash that appetite!